ALL in STUDIO designed the offices of commerce specialist eCommera/Isobar Commerce, located in Sofia, Bulgaria. eCommera / Isobar Commerce is the ecommerce practice of Dentsu Aegis Network that delivers transformative commerce experiences for global brands. The team in Sofia, Bulgaria consists of software engineers, solution architects, program managers and support executives who define, design and deliver solutions that turn visions into effective realities for brands like Asda / Walmart, Clarins, Ecco, Pandora. With deep understanding of technology and engaging culture of openness and transparency, eCommera / Isobar Commerce is seen as one of the most preferred employers in the software industry in Bulgaria. When they commisioned us to redesign their two levels office for about 250 people in Sofia, Bulgaria, we were happy to work with a company who wants design value and happy employees. It is true that one of the main tasks of any architecture and design, associated with a corporate brand is to create a visual and experimental identity. The architecture of “eCommera / Isobar Commerce” clearly fulfills that task, but also does more – it transcends brand identity and office culture to next level. The complany’s commitment to design goes hand in hand with willingness to pursue unorthodox procedures of implementation and construction. And this exprimentation has been good not just for business, but for architecture and design! Nowdays the parallels between office design and corporate identity must represent an important manifestation of the interplay between how people work, connect and share. The current office culture is sensitive. And we based much of our approach to make a design, that neither the client, nor the employees knew what to expect, but producing various ideas that shaped the office signature design. Our main task was to construct a desire to work inside! First of the challenges, it was the Layout for 7 different teams of 30 people each, restaurant, coffee shop, sports area, 10 meeting rooms different by size and about 10 meeting spots – aka “huddles”. After that we created the whole interior concept based on natural light, track lines and walkways. 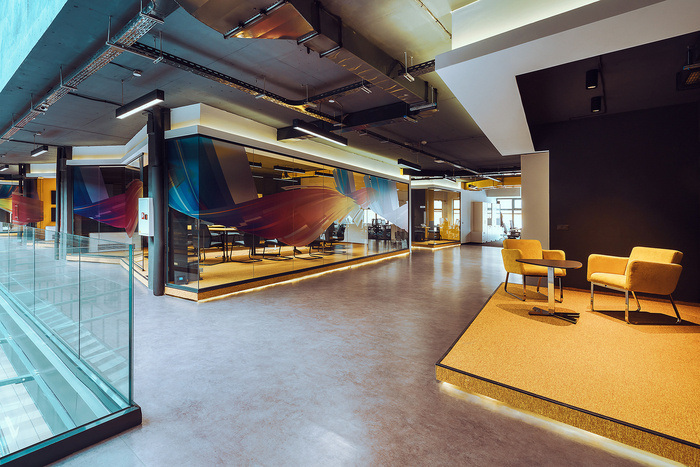 All the colors are connected with the corporate identity of the company and incorporated in different details – floors, hvac installations and furniture. We believe we created a creative, interactive and smart new home for all “eCommera / Isobar Commerce” and hope you will love it, too!